A good sushi rice recipe is essential, especially if you want your sushi rice to taste something like it came from a restaurant. 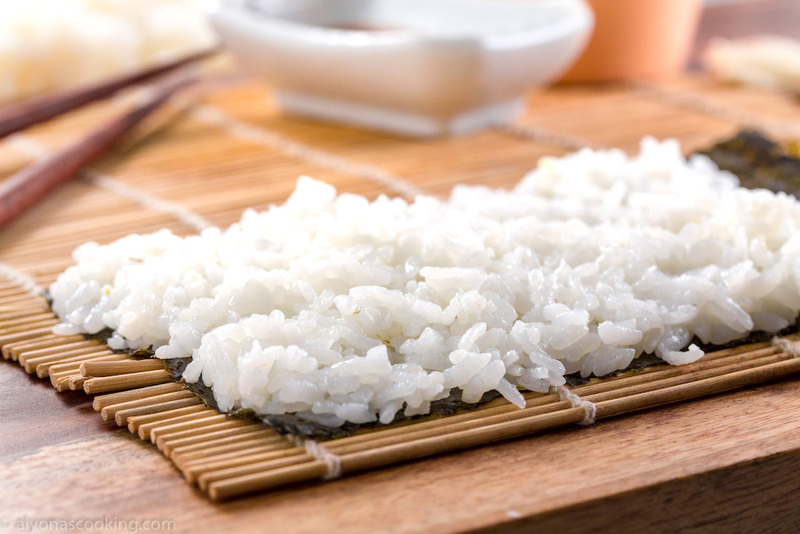 Find out how to make that perfectly seasoned and sticky rice for sushi without a rice cooker! This has been my go-to sushi rice recipe for some time now and you don’t need specific equipment to achieve sushi rice at home. I’ve even substituted the rice vinegar out with a great alternative ingredient that WORKS, with the same tasting results. This recipe is pretty basic and the technique works for me. I don’t think I even attempted other recipes once I got the hang of sushi making. I’ve made countless of batches with this sushi recipe (doubled, tripled, a single batch) and the ratio with sugar to salt, works great here. This sushi rice comes out mild with not too salty or vinegary results and it’s not over powering–like the way it should be! 1. Rinse the rice well, until most of the starchiness (foggy water) runs clear. Drain and place the rice into a medium sized pot and pour the water over the rice. Allow rice to just soak in the water for 30 minutes. 2. Bring rice to a boil and then reduce heat to low and cook for 20 minutes. After 20 minutes turn stove off and allow rice to steam for 15 minutes. DO NOT OPEN LID. Transfer rice into a large bowl (preferably NOT stainless steel) and set aside. 3. In a small saucepan dissolve the sugar and salt in the vinegar just until granules dissolve. Pour over the rice and gently toss together until well combined. Cover bowl and allow rice to cool to room temperature before rolling into sushi rolls. A good sushi rice recipe is essential, especially if you want your sushi rice to taste something like it came from a restaurant. 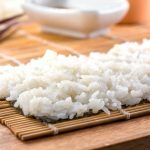 Find out how to make that perfectly seasoned and sticky rice for sushi without a rice cooker, right from home! Rinse the rice well, until most of the starchiness (foggy water) runs clear. Drain and place the rice into a medium sized pot and pour the water over the rice. Allow rice to just soak in the water for 30 minutes. Bring rice to a boil and then reduce heat to low and cook for 20 minutes. After 20 minutes turn stove off and allow rice to steam for 15 minutes. DO NOT OPEN LID. Transfer rice into a large bowl (preferably NOT stainless steel) and set aside. In a small saucepan dissolve the sugar and salt in the vinegar just until granules dissolve. Pour over the rice and gently toss together until well combined. Cover bowl and allow rice to cool to room temperature before rolling into sushi rolls.